 Choose products, including fabric and colour details.  Fill in fields on order form.  Click submit  you will receive a personal email confirmation of your order and amount due.  Or print and mail the order along with payment. After receiving your invoice you can pay by credit card (please add 3%) at www.paypal.com to account dfluscomb@gmail.com.  Your order will be shipped after payment is received.  Allow 4  6 weeks for delivery.  Shipping is done through the Postal Service. If you prefer another courier, please make that note on your order form, and the shipping charges will be altered.  We do not ship C.O.D. The following charges apply to all items except thangkas. Contact us for shipping fees outside North America.  Contact us for a Return Authorization.  Return the goods (in the condition you received them) within 14 days of receipt for refund or exchange. NOTE: We cannot refund shipping charges on returns. Can I order a gift for someone and have it shipped directly to them? Of course, we would love to accommodate your giving. On the order form, simply fill in the lucky recipient's information where it says "shipping information", and fill in the billing information section for yourself. Is there a bulk purchase discount? Many items in the catalogue have a reduced price at six or more. However, the total order must be at least $350. (before taxes & shipping) to qualify for that reduction. You do not have to be a retailer to take advantage of this policy. If you and five friends decide to buy a sadhana cover and a puja table cloth each, your order will likely reach $350., and you will each save 35% on your order. What about a credit policy for retailers?  Your first order must be prepaid.  Your second order must be paid on delivery.  A credit application is available for subsequent orders.  Credit card orders in excess of $349.99 will be billed a surcharge of 4%. Do you have any information on Scorpion Seal products? Yes, please send me an email about them: I would like to know about Scorpion Seal products! What cleaning procedures are required for my practice materials?  All brocades, silks, as well as bengaline, moiré and satin, can be dry cleaned. Hand washing may produce shrinkage and colour fading.  Cotton products ( prajna & upaya cloths, ang-rak) can be machine washed and dried.  Banners should be dry cleaned. Remove poles first.  Nylon flags are machine washable. Hang to dry.  The meditation belt should be washed by hand in cool water, and hung to dry. Send me dimensions, and perhaps a sketch of what you would like. If your design can benefit other practitioners, you receive a free cover  and credit for the creation. By all means, custom work is always a possibility. I would be delighted to turn your brocade into useful practice materials. Ask for a labour quote. Some products require choosing more than one brocade. Can I mix Chinese and Indian? Of course, if the choices you want to make do not offer themselves, simply input your desire into the comments box, and you will be contacted to confirm. You will pay the higher price of the Indian, however. How do I measure myself for a meditation belt? Sit in a full or half lotus with a tape measure. Hold on end at your left knee. Run the tape measure up over your right shoulder, across your back, under your left buttock, along left thigh, beck to the beginning. That number is the length you need to order. Where can I see and feel these products and fabrics? The Vidyadhara pointed out to me that on the flag the Tiger (orange)  Lion (white)  Garuda (red)  Dragon (blue) stripes needed to be in the reverse order. On the banner, the orange stripe is the lowest, therefore closest to the earth. 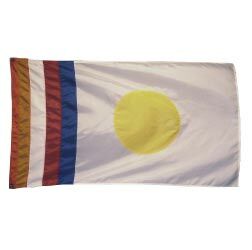 However, on the flag, the orange stripe needed to be on the outside edge connected to the flagpole, which is connected to the earth.